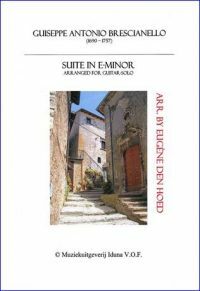 Twee complete suites van de Franse barok-componist Joseph Bodin de Boismortier gearrangeerd voor twee gitaren door Eugène den Hoed; de suite in C majeur opus XVII no. 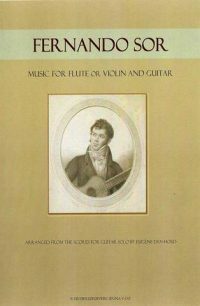 3 en de suite in G majeur opus XVII no 2. 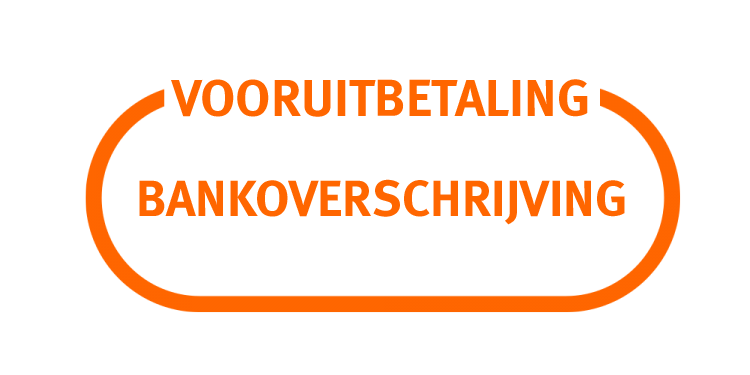 Het boek is standaard voorzien van een bijgeleverde CD. Op deze manier kunt u beluisteren hoe de stukken eventueel kunnen klinken. De stukken zijn opgenomen door Eugène den Hoed en Harald Heijnen. 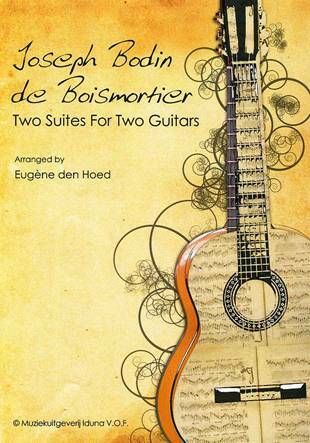 The Dutch guitarist Eugene den Hoed has produced some marvellous works over the years. 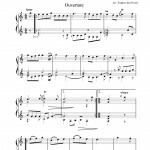 This latest one is an arrangement for two guitars from an original instrumental source but as there are no specific details, I can’t tell you what it was originally written for. The two suites concerned are a nine-movement one in C and a seven movement one in G.
The first one in C is very playable. There are not usually more than three or four voices in total over the two guitars and it all fits very well indeed. 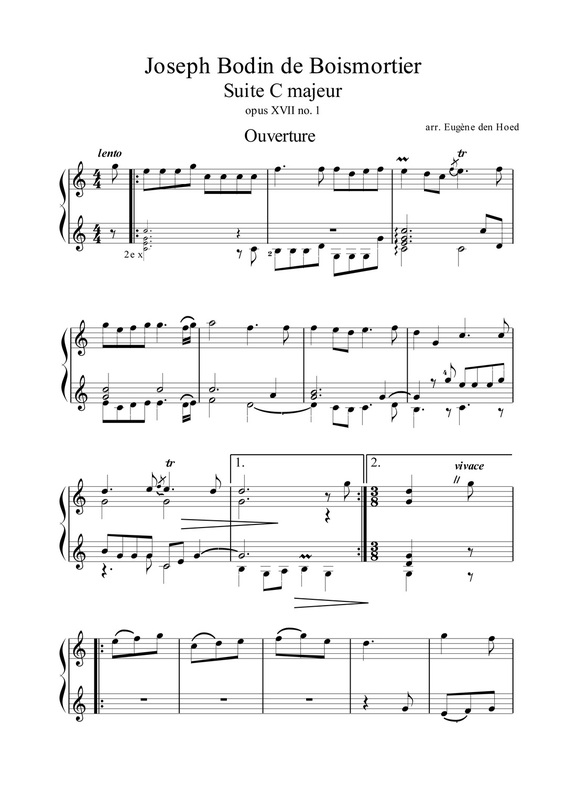 There is a pleasant allemande, a slightly surprising Fanfare, a work one doesn’t normally find in a baroque suite, a minuet, courante, rondeau, pavane, and a pair of da capo rigaudons to finish. If you can sense a little reticence in my words, it is because I found the music pleasant though sometimes rather dull. 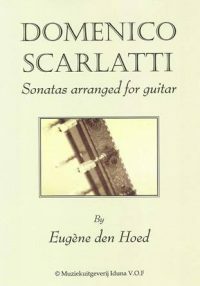 I love playing baroque on the guitar and have great respect for Den Hoed, but, oh for a modulation here and there to break the monotony. 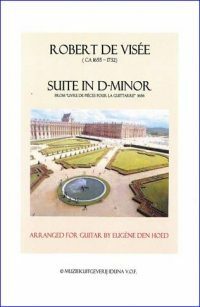 The second suite in G did nothing new to change my opinion gained from the first suite. It was nice and playable, and fitted well under the hands. At least here there were a couple of movements in G minor to relieve the constant three-chord trick. The standard of the arranging is very high, and as I said previously the music is playable and clear and finely fingered and produced.